NIU’s Avalon String Quartet will begin its concert year by performing one work from each period of the complete string quartets of Beethoven. The Avalon will begin with Quartet in D-Major, Op. 18, No. 3, followed by Quartet in F-minor, Op. 95 “Serioso,” and Quartet in F-major, Op. 135, No. 16. The concert begins at 8 p.m. Wednesday, Oct. 26, in the Boutell Memorial Concert Hall. The concert is free and open to the public, and the auditorium is accessible to all. The concert also will be streamed live on the School of Music website. 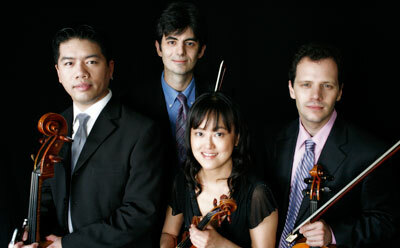 Members of the Avalon Quartet are Blaise Magniere (first violin, Richard O. Ryan Endowed Chair in Violin); Marie Wang (second violin); Anthony Devroye (viola); and Cheng-Hou Lee, (cello). Avalon members teach applied lessons and coach chamber music, and are active in their performance career bringing attention to the NIU School of Music from the concert stage and in other outreach activities. They annually perform a number of concerts on campus and on a concert series produced by NIU at Symphony Center in Chicago. Founded in 1995, the Avalon held residencies at NIU and the Hartt School. Prior to their appointment at NIU in 2007, they were the faculty quartet-in-residence at the Indiana University-South Bend Raclin School of the Arts for four years. For more information, call (815) 753-1546 or email lslater@niu.edu.